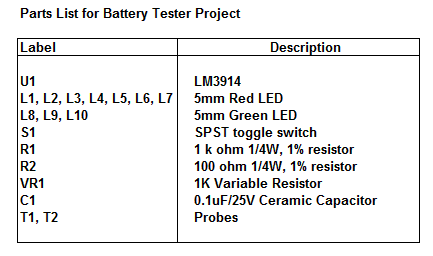 This objective of this project is to design and build a battery tester that is able to test various types of dry cell and rechargeable battery with a voltage of less than 2V. Configured as a bar graph battery level indicator, the LM3914 IC from National Semiconductor senses the voltage levels of the battery under test and drives the 10 LEDs to ON or OFF based on the voltage that is detected. The current driving the LEDs is regulated by using the external resistor R1 and hence limiting resistors are not required. The schematic shows the simple connections where the reference voltage at pin 8 of U1 can be adjusted by adjusting the variable resistor VR1. 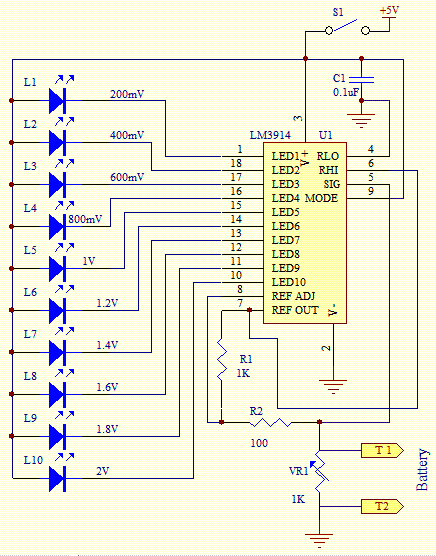 The voltage at pin 8 will set the maximum scale of the LED. In testing dry cell battery of 1.5V,set the voltage at pin 8 to 2.0V. Each of the LED will thus represent 200mV when lighted up. Test the circuit by using a breadboard before soldering the parts onto the PCB. This is to ensure that all the components that are used are in working condition. This is one of the simplest and interesting project that you can embark on if you have not try any project using this integrated circuit and the use of light emitting diodes. If testing of rechargeable battery such as NiCd or NiMH is required, set the reference voltage to a lower value such as 1.5V as the typical voltage of a rechargeable battery is approximately 1.2V. When testing the battery, take note of the polarity of the probe to the terminals of the battery. T1 is to be placed on the positive terminal and T2 the negative terminal of the battery. A digital or analog multimeter that is set to measure the voltage of the battery is necessary. The voltage that is measured is used as a standard against the voltage that is displayed on the LEDs.